The modern roller coaster has a history that is multi-national, that is varied and that can be traced back a lot farther than you may think. Also, despite presently having the largest number of roller coasters, the USA was not the home of the original ones. Instead, they can be traced back to 15th century Russia. The history of roller coasters goes back 600 years. Russia has always suffered extremely cold winters due to its northern latitude. At some point during the 15th century, people had the idea that they could perhaps use the copious amounts of ice and snow as a form of amusement. They devised sledges comprised of either wood or ice, and slid down hills and slopes. Indeed, during every winter today a lot of us will still do exactly the same thing. The only problem with this is that if you didn’t live near a hill, you couldn’t sledge. Consequently, it wasn’t long before natural slopes fell out of favour, to be replaced by specialist slides, which of course could be built anywhere. These used an iced-up wooden slope to serve as the track. 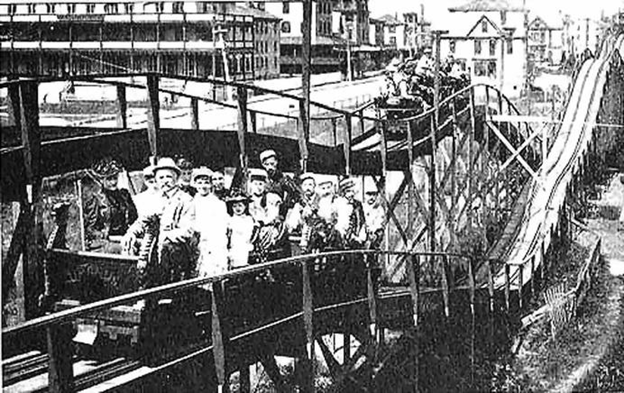 This was the first major step in ride development; the deliberate construction of a slope for the specific purpose of carrying passengers for pleasure. Some of these slides had slopes that were steep and generated high speeds for the riders. Ice or wood blocks still served as the cars, and the slides themselves were eventually known as Russian Mountains. These were the first crude roller coasters, but it was in a different country altogether that the second major step in coaster evolution was taken – the addition of wheels on the cars. This occurred in 17th century France, where it is most likely returning troops brought back the tales of the Russian Mountains. Due to the shorter winter season in France, dry slides were built using a wood track and wheeled cars carried the riders down to the bottom. However, the wheels initially weren’t locked to the track as they are today, instead the sledge was free to travel it’s own course down the track. This changed in 1817 when two coasters opened in Paris, Les Montagnes Russes and the Promandes Aeriennes. The cars on these rides were anchored to the track by an extension of the wheel axles projecting into grooves in the sides of the track. This made for a safer ride, which in turn meant that speeds could be increased up to about 30mph. When the cars reached the bottom of the track, at the end of the ride, they were manually pushed back to the top of the track to be used in the next ride. In 1826 a cable system was added, thus making the Paris coasters the first to utilise a mechanical system of hauling the cars up to the start of the ride. The following year the first step in the construction of the first coaster to feature a complete circuit was taken, with the opening of the Mauch Chunk Railroad in Pennsylvania, USA. It was initially built to carry coal from a mine up on Summit Hill 18 miles down to the Lehigh canal. The journey down was – literally – all downhill, and therefore relatively simple, but mules took six times longer than the 30 minutes for the downhill trip to haul the cars back up the mountain. So, in 1844 a second track was built, complete with steam engines to haul the cars back up the mountain. The two parts of the track were connected, thus enabling the cars to complete a circuit. By 1872, however, economics forced the closure of the railroad, so it was turned into a tourist attraction. Visitors came from miles around to travel to the top of the mountain, enjoy the views, eat at a summit restaurant and finally, they would travel the scenic railroad to the bottom. It was this last part which made the trip memorable for most people, as they were not prepared for the terror of the 18 miles down to the bottom the mountain. The cars sped down the steep track, threatening to fly off at every corner and throwing the passengers from one side of the car to the other as they rounded each turn. This experience on the first circuit contained many of the features still found on modern rides, such as tight corners and fast speeds. One of the passengers on the Mauch Chunk Railroad, La Marcus Adna Thompson, saw the potential of such a ride as a tourist attraction, and set about building his own. This opened in 1884 at Coney Island in New York, USA, and was known as a switchback railway. It was an instant success. Thompson charged 5 cents a ride, and made his entire investment back in days as people flocked to ride his new attraction. This was another major step in coaster evolution, as it proved that people would pay for the experience of riding in a car down a wooden track. However, it still required employees to push the cars to the top of the track once a ride was completed, similar to the 17th century French rides. The first switchback railway that featured a circuit opened several months later, also at Coney Island, by a Charles Alcoke. Again, the cars were hauled to the top of the hill at the end of the ride. Both these rides were superseded by a third ride built on the opposite side of the country in San Francisco. Philip Hinckle’s ride was built the opposite way around to the two Coney Island rides; namely at the start of the ride, cables hauled the cars up to the crest of a hill, whereupon they descended down a drop, and round to the base of the hill again. This ride was taller and also faster than the two Coney Island attractions. The reply by Thompson was to form his own company to build rides of his creation, and the construction of switchback railways went from strength to strength over the next 20 years. They sprang up all over the USA and Europe, as people in numerous countries followed the Coney Island patrons’ example and paid for the amusement of riding one. They also gradually became known as scenic railways, as they were often themed with stories from the Bible, mythology, and historical events, and consequently were quite elaborate. Several scenic railways are still operational today. Two examples are the rides at Margate and Great Yarmouth in England, both of which date from the early 20th century. As scenic railways developed, ride manufacturers were constantly looking for more ways to thrill the public. Lina Beecher designed the first coaster with a loop, the Flip Flap railway located at Sea Lion Park at Coney Island. The two-passenger cars ran downhill before entering a vertical loop, which looked exactly the same as those used on coasters today. However, the high G forces experienced by the riders when travelling through the loop meant that they often blacked out or sustained whiplash injuries. Due to this, the public very quickly deserted the ride in droves, it closed soon after opening and vertical loops disappeared for over 90 years. Despite the problems with loops, the public was still demanding bigger and better thrills from parks, as the scenic railways were being seen as old hat and too slow. This resulted in teams of designers, parks and ride manufacturers collaborating to provide the greatest rides that had been constructed up to that time. As all these teams competed with each other, the scenic railways got faster and faster, and began to resemble the modern wooden roller coaster more and more. This construction frenzy culminated in the building of over 2000 coasters in the 1920’s. Many of these rides were so well made that they continue to thrill the public today. These include, among others, Roller Coaster (1912) and Big Dipper (1923) at Blackpool Pleasure Beach, England and in the USA the Giant Dipper (1925) at San Diego, California, the Thunderbolt (1924) at Kennywood Park, West Mifflin, Pennsylvania, and of course the Cyclone (1927) at Coney Island, New York. The Golden Age of roller coasters came to an abrupt end in 1929, with the Wall Street Crash and subsequent Great Depression. Park patrons became more concerned with the essentials of daily living than spending time – and money – riding roller coasters. This in turn led to parks and manufacturers going bankrupt, and many rides fell into disrepair as they were abandoned, or simply torn down for good. For a short period ride manufacturers concentrated on Europe, with the Grand National (1935) at Blackpool Pleasure Beach in England being the finest coaster built in this period. But the outbreak of World War II in 1939 meant that a more pronounced revival in the fortunes of coasters was even more unlikely. However, some companies that had constructed the best coasters continued to make money and remained solvent. When World War II had finished, coaster building began to resume in the USA, with the Comet (1948) at Lake George, New York, (originally located at Crystal Beach, Ontario, Canada) and the Phoenix (1947) at Knoebels, Pennsylvania, USA (originally located at San Antonio, Texas) two examples. These rides, however, were few and far between. Coaster manufacturing didn’t come anywhere near the levels seen in the 1920’s, and with the growth of the car as the mass transit vehicle for the public, only parks which had large parking areas remained in business. If there is one thing that served to regenerate the public interest in roller coasters, it was the opening of Disneyland in Anaheim, California, USA on July 15th 1955. As the post-war economic boom set in throughout the United States, people had time and more importantly, money on their hands. Consequently the public poured into Disneyland from all over the US, and this saved the entire theme park industry from going to the wall. The third major step in the evolution of the coaster also occurred at this point, with the opening of the Matterhorn in 1959. The fundamental change here was the use of steel for the track, instead of wood. This would begin a battle between two camps, the ones who preferred the traditional material of wood, and those who wished to build using the more malleable and tougher steel. The unparalleled success of Disneyland led to more theme parks being planned. These required rides and attractions, and this in turn started a second coaster boom. In 1964, the opening of Mr Twister at Elitch Gardens, Denver, Colorado, USA, and the later 1972 opening of the Racer at King’s Island, Cincinnati, Ohio, USA, began this second growth period. In 1975, the steel coaster took the evolutionary lead when the ride with the first inversion since the early scenic railways opened, the Revolution at Six Flags Magic Mountain, Valencia, California, USA. The first corkscrew inversions were developed at the same time; this inverted riders twice, and the competition became more intense when Cedar Point, Sandusky, Ohio, USA opened its Corkscrew ride, which contained both elements; i.e. three inversions. Theme parks also began to develop in other parts of the world during this period, as the global progression of the second golden age of roller coasters mirrored the first. Therefore, since the late 1970’s, theme parks all over the world have competed to build the most thrilling, modern coasters imaginable. There was the first suspended coaster in 1981, the Bat at Kings Island, (though technical problems meant it was soon dismantled). The first stand-up coasters debuted in 1982 in Japan, manufactured by TOGO and exported to the USA two years later in the form of King Cobra, also at Kings Island. A ride that requires almost six minutes to complete opened at Lightwater Valley, Ripon, England in 1991: The Ultimate. Until the summer of 2000 it was the worlds longest at 7542 feet, or 1.6 miles. In 1992, the first inverted coaster appeared: Batman the Ride at Six Flags Great America, Illinois, USA. There are now also roller coasters that are completely transportable. The Eurostar is an inverted ride that can be assembled in 4 days, whilst the Olympia Looping coaster has 5 vertical loops in an incredibly compact layout. Both these rides travel the fairgrounds of Germany in the spring and summer. The use of Linear Induction Motors (LIMs) instead of chain lifts made the 100mph ride possible; Superman: The Escape at Six Flags Magic Mountain. Most recently, technology has now resulted in a ride that travels at 120 mph – Cedar Point’s Top Thrill Dragster. The number of inversions has risen to ten on the Colossus at Thorpe Park in Surrey, England – compared to the one on the Revolution in 1975. The first wooden coaster in South America opened in 1999, in the form of the Montezum at Hopi Hari in Sao Paolo. The height of the tallest coaster has more than doubled in less than 15 years, from the 205-foot tall Magnum XL-200 at Cedar Point, to the huge 420-foot high Top Thrill Dragster. Length’s have become impressively large too – Steel Dragon at Nagashima Spaland, Nagoya, Japan is currently the longest at 8133 feet. The same is true for speeds have increased too from a modest 50 mph in 1975 to today’s 120mph. Several new types of coaster have also been more recently unveiled. These include flying coasters, the first model of which is Stealth, located at Paramounts Great America, Santa Clara, California, USA. Here, the seats tilt back and the cars are suspended below the track, to give the sensation of flight. Two more manufacturers – B&M and Zamperla – have since developed their own versions of this ride. TOGO has developed a heartline coaster, where the rider is rotated 360-degrees in a line around his/her heart. The only location where this type of ride is currently operating is Six Flags Astroworld, Houston, Texas, USA in the form of Ultra Twister. I must also mention Hypersonic XLC, which opened in 2001 at Paramount King’s Dominion, Doswell, Virginia, USA. This was the first coaster powered by compressed air, and fires riders 90 degrees vertically upwards to the top of a tower, over the top and 90 degrees straight down again. Subsequently, a second type of this ride has now opened in Japan. Dodonpa at Fujikyu Highlands park features three vertical towers, and has a faster topapeed of 107mph. Finally, there is California’s Six Flags Magic Mountain. This park debuted X, the world’s first Arrow 4th Dimension coaster. This amazing ride features rotating seats, which are spun around forwards and backwards whilst the train traverses the circuit. In 2005, Six Flags Great Adventure upped the record ante by introducing a coaster similar to Top Thrill Dragster, called Kingda Ka. Breaking the 450 foot barrier, the coaster tops out at 128mph. However, like Top Thrill Dragster (experiencing major issues in 2003 and 2005), Kingda has been plagued with mechanical problems, where it was closed for several weeks. In order for any industry to be successful, it requires a market for its products. At present, the market for roller coasters is pretty good. Park attendance is increasing year on year, which means the public is returning to parks time and again. Therefore, they must be enjoying the current attractions, and be able to stomach more and greater thrills. Consequently, manufacturers are currently designing more and more roller coasters all over the world. In 2003 alone, we have seen the world’s tallest and fastest coaster open at Cedar Point, the previously-mentioned Top Thrill Dragster. A ride with a 95-degree first drop opened in Denmark, whilst two more B&M flying coasters opened in the USA. Six Flags continued to purchase and re-brand parks in the USA and Europe, the latest example being the former Jazzland in Louisiana, now called Six Flags New Orleans. In 2004, however, Six Flags began the trend of downsizing its corporation and started to sell its parks. Despite a large-scale nationwide advertising campaign featuring Mr. Six, a geriatric dancing thrill-seeking mascot who took a vow of silence, it began with the sale of its European division to a private investment firm, which renamed many of the parks Walabi World or other localized names. Within weeks, it later sold its Six Flags Worlds of Adventure park (formerly Geauga Lake and Sea World Ohio) near Cleveland to Cedar Fair, LP, who promptly renamed it back to Geauga Lake. By mid-late 2005, it announced it as closing AstroWorld in Houston, Texas due to parking and declining attendance/revenue issues. By then, it had announced that the entire company itself was for sale, in hopes to block any takeover by Daniel Snyder, a stockholder and vocal critic of the park’s operations. In addition, Six Flags New Orleans was hit with severe flooding caused by Hurricane Katrina, shutting down the park for the rest of the season. Rumors have floated around that Six Flags New Orleans itself might also be the target of a sale. The limits on G forces that the human body can tolerate, coupled with the physical limits track and cars can safely handle, means that ride manufacturers will have to be careful not to repeat the mistakes of the first golden age. This was, of course, when rides were so intense that people didn’t ride them. The dismantling of Drachen Fire at Busch Gardens Williamsburg, Virginia, USA, in February 2002 indicates this perfectly. This Arrow-manufactured coaster only opened in 1992, but was re-profiled and had a corkscrew inversion removed after only two years due to complaints about excessive roughness. The problems only got worse however, with low ridership and negative comments, and the ride closed in 1998 for good and has now been demolished for scrap. Over 30 years ago however, when the current boom in coaster construction began, who would have predicted the rides that have evolved, the inversion elements that they contain, the heights that they achieve and the fact that every continent except Antarctica now possesses world class roller coasters of all types. It is refreshing and exciting to conclude by saying that the second golden age of roller coasters shows no signs of stopping. Special Thanks to Andrew Rathe for providing the initial copy of this history.